Any recipe that uses feta cheese in it, makes me a happy girl. It’s the middle eastern inside of me that is always craving a little feta. Growing up feta cheese was practically it’s own food group in our household. We always had a plastic container filled with it and somehow it seemed to work its way on to the table during every meal. A little strange, right? If you’ve never tried feta cheese before, it’s highly recommended! I even love sprinkling it on a fresh salad. I am pretty excited about this dish because Husband used to be 100% anti seafood, until more recently. Now whenever I cook any type of seafood I hold my breathe hoping that we will like it. I’m happy to report that I got a two thumbs up on this dish! We both loved the flavors of the salmon and I especially loved how quick it was to put together and cook! 2. Mix olive oil and vinegar in a bowl. 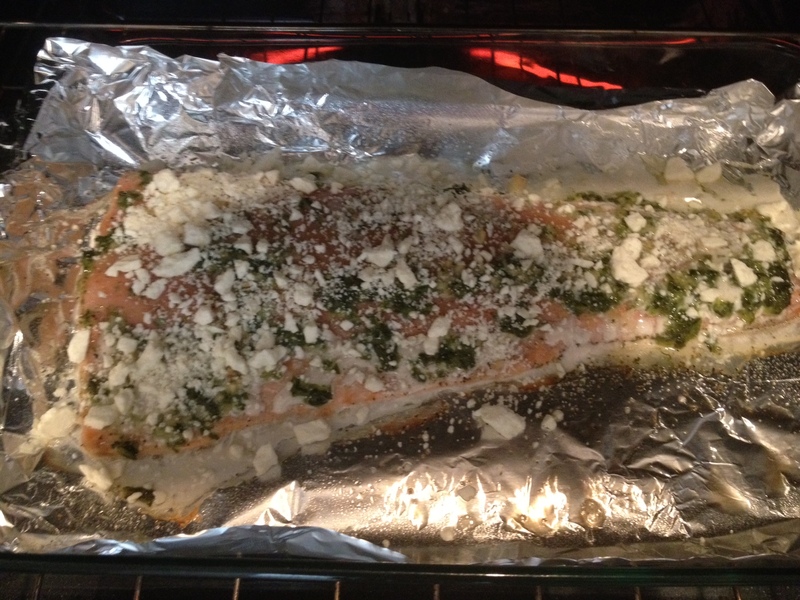 Place salmon filets in shallow baking dish. Rub garlic in to filets and then pour oil-vinegar mixture over. Add basil, a pinch of salt and pepper. Top with feta cheese.